The other day, Emily from Pizza & Pull-ups announced the exciting news that she recently moved. 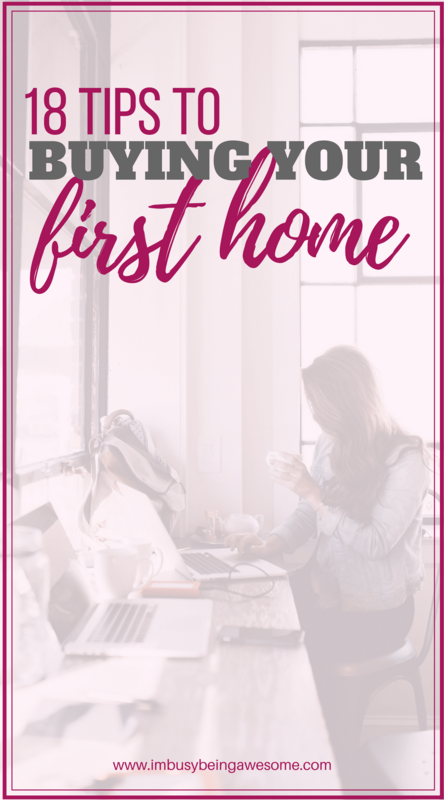 While it sounds like she had a relatively smooth process, reading her post made me think about my own adventures buying a house a few years ago; let me just say, “smooth” is not the word I’d use to describe the experience. Let’s face it, the home buying process can feel like a mystery, and it’s often a bit overwhelming, especially as a first-time homebuyer. 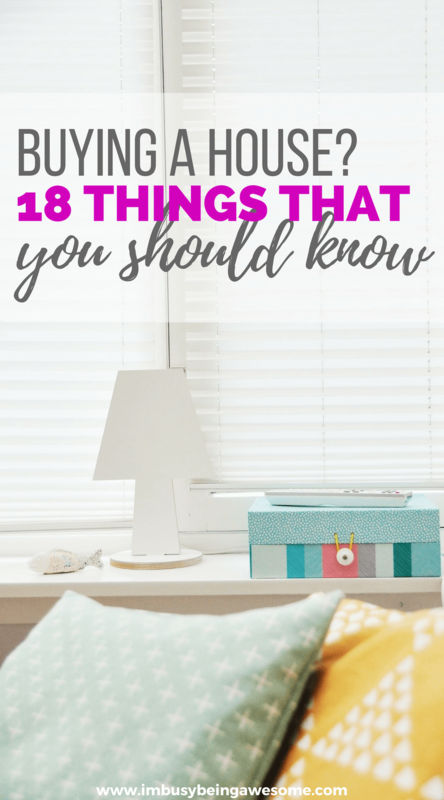 Therefore, I thought I’d share what my husband and I “wish we knew” in hopes of making YOUR next home buying process that much easier. 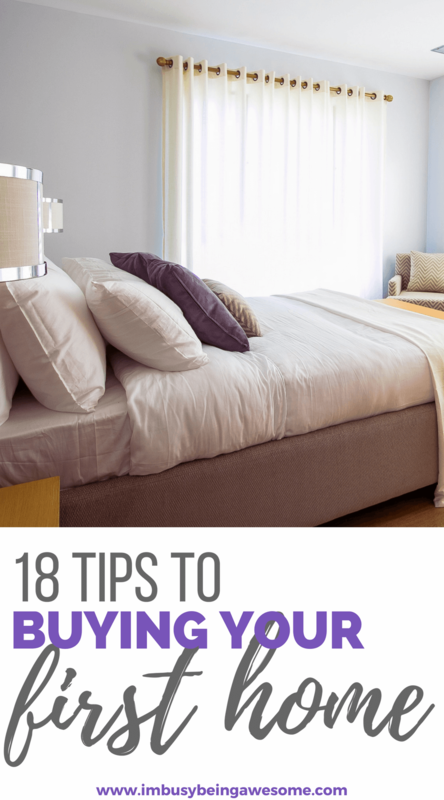 So if you’re in the market for buying a house, check out my 18 tips, and start house hunting with confidence. Take some time to consider what is more important to you, location or space. Are you a city dweller who prefers a smaller home or condo? Or do you want more living space further out in the suburbs? There are certainly pro and cons to each option, so it’s important to think about what’s most important to you. Whether you have children or not, the quality of the school district will impact property value. This is important to keep in mind for if/when you decide to sell the house, as it will influence the resale value. Like location vs. space, this next item is also personal preference. Do you want to save some money on the initial purchase and work on home improvements yourself? Or, do you want to pay a little more for a house that’s move-in ready? Because of Ryan and my schedule, I knew we needed the latter for the big stuff. While we might want to update the look of a room in the future, we knew we didn’t have the time or resources to embark on major renovations before moving in. Many others who are buying a house, however, love the idea of DIY home renovation. So take some time to figure out what’s most important to you, and stick with it. This might seem minor compared to the house in which you’ll live, but landscaping is also important to consider when buying a house. Is it what you want? Will it be easy to change if not? You see, like home renovations, landscaping can also take significant time and money. And while it’s certainly more forgiving than electrical or plumbing work (seriously, just hire a professional for that), it can still be quite the undertaking. So again, decide what’s important to you, and go with it. Will there be major building projects near your home in the near future? New condo developments? An apartment complex? A shopping strip? Office buildings? These changes can greatly impact the neighborhood into which you think you’re moving. So make yourself aware of any potential projects. Similarly, be sure to visit the house at different times of the day. This was a tip my dad taught me when buying a house. While most of us go house hunting on quiet weekends, remember that traffic and the “bustle” of the workweek might be significantly different. If you’re looking to buy on a potentially busy road, but its doesn’t “seem too bad” when you visit on the weekend, be sure to check back during morning and evening rush hours to see what’s going on. As an example, my friend just bought a house near an elementary school, which she wanted. However, she is also right near the bus lineup. This means at certain times of the day, it’s very difficult for her to get in and out of her house simply due to the bus traffic. It wasn’t a “make or break” for her, but it might be for someone else, so keep these details in mind. When Ryan and I first started looking at homes, we weren’t entirely serious. It was more of a dream: “Wouldn’t it be amazing to get out of this apartment and have our own space? ?” You know, that of thing. So we would swing by different open houses to see what we liked and what we didn’t; it was a great way to see what both of us were looking for in a home. Once we got more serious about moving, however, and we found a house that we loved, we hadn’t taken the time to get a home loan yet. In other words, we chose the house before we had the money. Unfortunately, because it was a seller’s market, the house had sold by the time we secured the loan. I was crushed. So once you’ve shifted from dreaming about buying a house to getting serious, secure that loan; you never know when you’ll have to make an offer. Don’t spend all of the money that you’re approved for the loan. Seriously. From what I’ve learned, people are often approved for a much larger loan than they could comfortably afford; we certainly were. For instance, if we had used the entire loan, we could have paid the mortgage in theory. But, we wouldn’t be able to pay any of our other bills let alone buy the luxuries of living like, you know, food and clothing… They call it being house poor. So make sure you’ve created a detailed budget with lots of wiggle room for when things come up – because they will come up. In the first year of buying our house, we had to fix our boiler, replace our washing machine and dryer, fix a leak in the upstairs shower, and fix a leak in the kitchen sink. That stuff adds up quickly. Again, these are little things in the grand scheme of buying a house, but they all add up quickly, so make sure you have money saved. Has the house had major renovations? If so, were they done legally with a permit? In our house, the previous owner had installed a wood-burning stove in the basement himself, which wasn’t legal. Because we knew it would cause issues during resale, we had him remove it before purchasing the home. Ask to see the utilities for heating, cooling, water, and electricity for the past few years. Does this fit within your budget? Which appliances will the seller leave behind? Are they taking the washer and dryer? What about the new refrigerator? Make sure you’re crystal clear about what’s going and what’s staying behind. Otherwise, you might be in for quite a surprise. Where does your property end and your neighbor’s begin? Ensure that you know exactly where your lines are, as it’s not always as it appears. Does the home have any forms of security present? If so, what are they? Figure out where the fuse box is. Learn where the main water turn-off is. Make sure you know where the water and gas meters are. Where are the hose hook-ups around the house, and where can you turn off the outside water in the winter? When you go in for a second viewing of the house, head over and meet the neighbors. Seriously! You will live next to these people for the foreseeable future, make sure you want them as neighbors. Luckily, Ryan and I have wonderful neighbors. When I was home alone and sick over Christmas, we had a huge snowstorm. My next-door neighbor came over and cleared my driveway and sidewalks without me even asking. My neighbor across the street always borrows me her electric hedge trimmer when I’m out taking care of my unruly hedges with my – highly inadequate – hedge clippers. What’s more, both families are a joy to talk with on Sunday mornings when we’re out taking care of the yard, shoveling snow, etc. This was a valuable experience for Ryan and me, especially as first time homebuyers. I’ll be the first to admit that we had no idea what to look for when considering all of the house details. Therefore, it was the home inspector who pointed out the above-mentioned illegal wood stove. He’s the one who climbed up in the attic to ensure it was properly insulated. And he’s the one who discovered the house was missing an exhaust fan in the kitchen etc. It never hurts to have a second pair of trained eyes look over this major investment before make the final decision. Some homes belong to a homeowner association. This type of situation often require regular dues, adhering to specific rules, following specific codes etc. If you’re moving to a home that’s part of a HOA, make sure you understand all of the requirements associated with it. If you’re hiring movers, make sure you do your research. While finding an affordable price is certainly important, so is making sure your stuff arrives undamaged and in one piece. Ryan and I ended up with broken dishes and lamps, and scratched wood floors and walls in our new house. Not cool. So read through the company’s policies online. Check out their customer testimonials. Then, goto Yelp and Google Reviews, and see what others are saying. As a bonus, if you know someone else who has moved recently, ask for their advice! If they found a good company, and they were happy with the experience, that’s always reassuring in my book. And there you have it, friends. 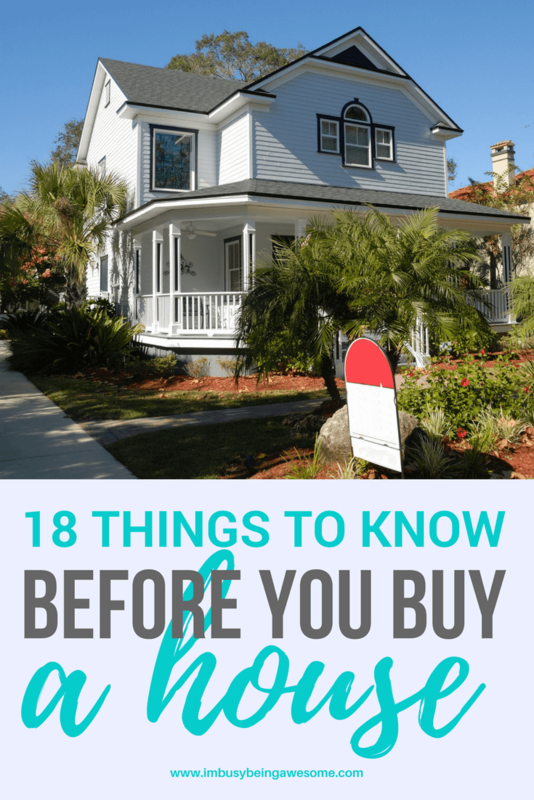 18 things to know before buying a house. Have you bought a new house recently? Are you thinking about buying a house? What do you wish you knew? What advice can you share to make others’ experiences easier? Share your strategies below! Thank you! I wish I knew them the first time around, too. Ha! What a comprehensive read. Keeping an eye on the traffic close to the house is SO important. My parents were house shopping earlier this year and they found their dream home – little did they know that a train track was really close to the house. When they went to the home for an inspection – thank god the train went by. It was extremely loud. They were luckily able to get out of the deal – but that was definitely a lesson learned – check google maps!! Oh wow – what a fantastic tip, Yolanda! I never thought about a train whistle. That would be terrible! My husband and I just bought in November and definitely considered all these items…especially traffic as we work in DC! Really good tips. Location,location,location! It is everything. Another tip. Make sure you don’t put more into the house in renovations than you can sell it for. Some neighborhoods have a price cap. That is WONDERFUL advice, Julie. Thank you! Thank you, thank you, THANK YOU!! My husband and i are in the process of buying our first home and this definitely helps. Great tips! Our new house is the second house we have bought and we learned sooooo much from the first rodeo. Buying your first home can be such a roller coaster experience.